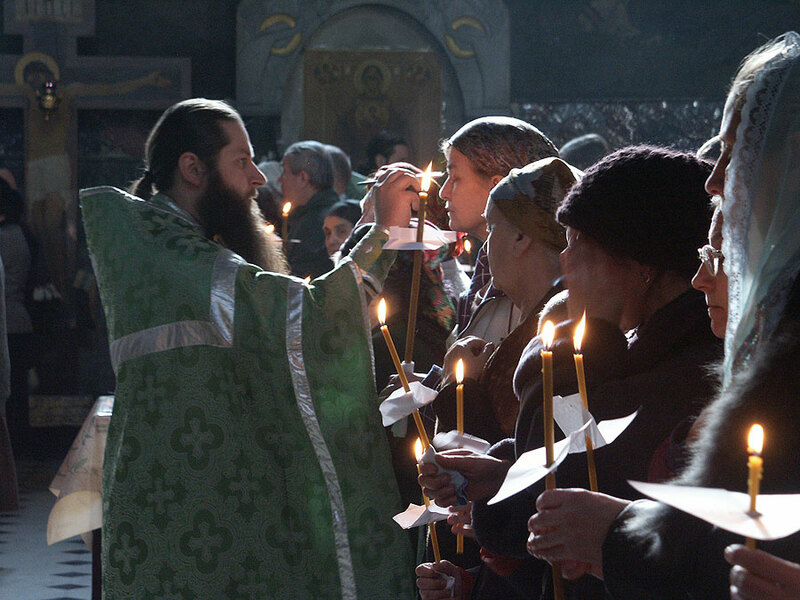 It is a tradition in the Orthodox Church for all the faithful to receive Holy Unction during Great Lent. In many churches, this service is celebrated specifically on Holy and Great Wednesday, after the Matins served that evening. The Sacrament of Holy Unction is a sacrament of faith (James 5:14-15). It is meant for any sick person and is always celebrated in the hope that it will bring healing. While this certainly is the desired effect, it is not the indispensable condition of the Sacrament. The essential purpose of the sacrament is to allow the person to share in the victory of Christ and to raise him into the realm of God's Kingdom. It communicates spiritual power so that the trials of sickness may be borne with courage, hope and fortitude. The solemn celebration of the Holy Unction on Great Wednesday serves to remind us of Christ's power to forgive and liberate the conscience of personal and collective sin. Thus, it helps emphasize the glorious expectation of Pascha: the resurrection, redemption and sanctification of all life. In addition, it helps us to realize how fragile human life really is and how dependent we are on God; if our life is to have any true meaning. 1. Introductory Prayers and Psalms 143 and 51. In these Psalms we confess our sinfulness before God and ask Him to cleanse us and renew a right spirit within us (Psalm 51:10). 2. The Canon. In this series of verses that are read or sung, we ask God to show mercy upon us and cleanse our souls, to drive away all evil powers, to grant salvation to those who are sick or suffering, and to grant us the healing of our souls and bodies. At the end of several sets of verses, we ask God to renew our lives so that we may bless, thank and glorify Him forever. 3. Short Prayers or Troparia to the Saints. We pray to the Saints, especially those who have helped the sick and suffering, to those who have been martyred for the glory of God, and to the Mother of God to intercede for us for the salvation of our souls. The Great Martyr Demetrios (A.D. 306, Thessalonica), whose bones still emit chrism, is famous throughout the East as a healer of the sick. Demetrios, who was in prison at the time, predicted that through his prayers Nestor would conquer the Emperor's favorite gladiator Lyaeus. The Emperor was so angered that Nestor won, that he had both Demetrios and Nestor killed. Saint Panteleimon of Nicomedia was a Christian physician martyred for his faith in 304 A.D. He performed many miraculous cures in the name of Jesus Christ. "Unmerceneries," the title given to those physicians who refused payment for their services, goes to two of the most famous miracle-workers in the early Church, Cosmas and Damian. At the conclusion of the service, the open Gospel book, which contains the accounts of Jesus' many miracles, is placed with the printed pages down upon the heads of those who are ill. By doing so it is hoped that they will also receive physical and spiritual healing and that the faith in the written word of our Lord will be strengthened in the minds of those present. Just as Christ laid His hand upon the sick when He performed His many miracles, the priest lays his hand upon the Gospel, which rests on the heads of the faithful. Each of the seven prayers asks for the remission of our sins, for the healing of our souls and bodies and for life everlasting. On Holy and Great Wednesday the divine Fathers ordained a commemoration to be kept of the woman who was a harlot and who anointed the Lord with myrrh, inasmuch as this took place a short time before the saving Passion.